GET READY TO BE REALLY EXCITED!!!!! The (12)participating Hop shops in Houston are making a great quilt for you, using an exclusive Island Batik fabric you are going to love. The theme for 2012 Houston Hop is “Colors of Hope” and is designed to share yours and everyones concerns and love for those who are battling all types of cancer, diabetes and heart disease as well as honoring those who are the wonderful caregivers. We are using many Cancer Awareness Ribbon colors that are so beautifully displayed in the Hoffman 1895 Batiks and these same colors are repeated in the exclusive fabric. Deborah Borsos designed the unusual off set center, pieced quilt, with a glorious Dove in the center medallion that can be machine or hand appliquéd. All the shops are busily planning their gifts, activities and refreshments for the Hop as well as getting the quilt made for you to see. In the works for you also, is another gorgeous Jeep Collins silver charm and you will love it because it fits right in with the design and intent of the quilt. It’s a surprise!!!! 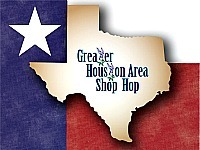 Please visit our Shop Hop web site at: www.houstonshophop.com for all available information about Houston Shop Hop 2012 including maps, shop names, times, dates, prizes, etc. See you there.